Last night I stayed up late and finished up the excellent novel by Elizabeth Chadwick, For the King's Favor ...LOVED it!!! Now I'm off to explore the world of Georgette Heyer, as well as, 11th century Sicily. She will become...the Great Maria. 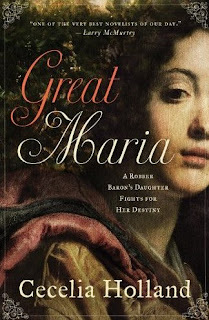 A lush portrait of the eleventh century that leaves out none of its harshest nature, Great Maria is Cecelia Holland at her most evocative. A mere fourteen years old, strong-willed Maria is betrothed to Richard. Theirs is a marriage of conflict, yet one that grows over the years into respect and partnership. As they struggle-at times against each other, at times side-by-side-Maria and Richard emerge as full-blooded characters you'll never forget. 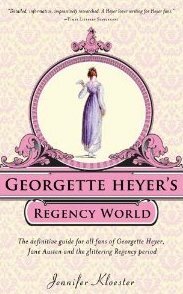 From the fascinating slang, the elegant fashions, the precise ways the bon ton ate, drank, danced, and flirted, to the shocking real life scandals of the day, Georgette Heyer's Regency World takes you behind the scenes of Heyer's captivating novels. As much fun to read as Heyer's own novels, beautifully illustrated, and meticulously researched, Jennifer Kloester's essential guide brings the world of the Regency to life for Heyer fans and Jane Austen fans alike. Both of these books sound good, though Great Maria is the one that I am most excited to hear about. I do so hope you enjoy them and I can't wait to read your reviews, not only for these, but for the Chadwick as well! I'm looking forward to For the King's Favor. I'm currently reading a novel about colonial Jamestown. The title escapes me at the moment. It's rather exciting! I finished For the King's Favor in a couple of days of receiving it from the publisher. It was wonderful (as usual from EC!). Great Maria sounds so good and I love the rich colors of the cover. Enjoy your reading. I like the sound of GREAT MARIA. Is it based on real people? I can't wait to read GEORGETTE HEYER'S REGENCY WORLD. I love discovering the details of daily life in different time periods. right now I am reading ISADOR'S SECRET by Mardi Link. It is the account of the 1907 murder of a nun in a small, rural town in northern Michigan. Even today locals will not talk about the case. Evidence and documents are missing and her grave can not be found. In the car, we are listening to IN A SUNBURNED COUNTRY by Bill Bryson. I enjoy his wit.